So this orange scarf was one of my first fall purchases last fall from Nordstrom from their BP line. If y'all haven't checked out the BP line's clothes & accessories, stop what you're doing and go HERE! They seriously have some of THE cutest things, and for very affordable prices. Which, may I add, is one of my favorite things about fashion! Finding affordable yet cute pieces. There is nothing better. Fashion does NOT have to break the bank. It is 100% possible to dress stylish and not spend a fortune! Shirt dresses are one of my favorite fashions. Not only are they comfortable, but they offer that effortlessly cute look! This one is an older version from F21, but I have linked 2 really cute options above. The one I am wearing has a draw-string cinch waist, which gives the option of accentuating your waist, but, if you would rather wear it loser that is totally possible with the draw-string waist as well. I love the way a scarf looks paired with a shirtdress! It adds some color and style to a monochromatic dress. 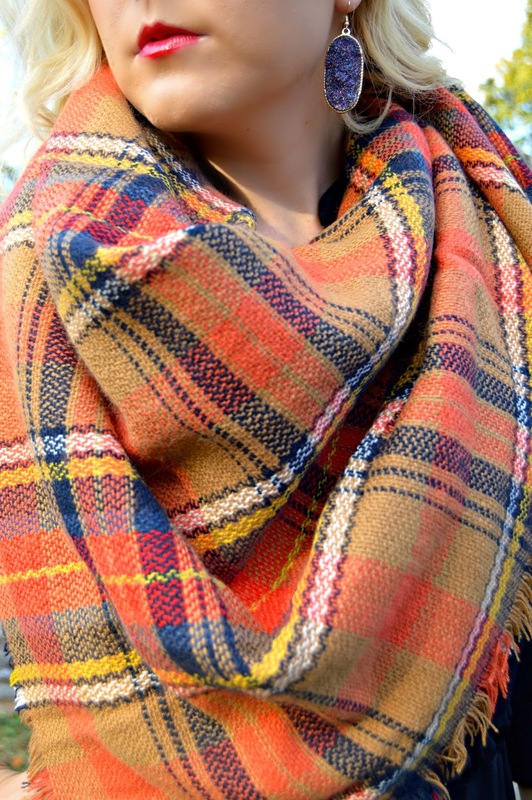 This scarf is one of my favorites I have bought this past fall/winter season. Y'all know I'm obsessed with my blanket scarves! I love scarves like some people love shoes, haha! I firmly believe you can never have too many. 2017 is starting out great so far! I am currently in Nashville for school. So far I've been busy studying and then wedding planning in my downtime. Our wedding is getting SO close and I can't wait!!! Speaking of getting wedding ready, my main New Year's resolution is to start drinking more water. As a nurse/future NP, I am well-aware of the health benefits of drinking water. However, I will be honest with y'all...I just don't care for it very much! I would rather be drinking a Diet Coke, haha. So, my trick for trying to drink more water is to use my pretty hot pink Yeti cup that one of my besties gave me (thanks Gracie!). As funny as it may sound, there's something about drinking out of a pretty cup that makes it more appealing to me. So my goal is to drink 3 Yeti-full cups of water a day. Proud to say that I met my goal today! One day at a time right?! Does anyone have any tips for making drinking water more enjoyable?? I would love to hear them! Anyway, thanks so much for reading dolls!!!! I always appreciate each and everyone of you who take the time out of your day to check out my blog posts. After Party Lilly Sale: Final Hours! Double the Leopard, Double the Fun!